Why Should Reloaders Use Bobs’ .223 Bulk Bullets? Our longer total copper full-metal jacket reduces bullet jump, and increases speed and accuracy while reducing barrel wear. Our custom-blended heel provides a more uniform base, which increases accuracy. Our tight weight tolerances provide consistent ballistic performance. Our light cannelure reduces jacket distortion, which improves accuracy. Our core is seated deep within the jacket, reducing air space and resulting in a more accurate bullet. We obtain lead in bulk batches of 40,000 lbs, which means higher production consistency in all our bulk bullets. 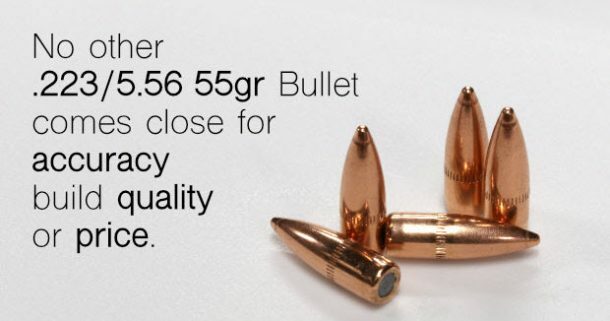 Our rigorous quality-control process means only the bullets that meet our highest standards are released for sale. “Not a big review writer but these are worthy of it. I’ve ordered several times and the quality and consistency are always top notch.” — Wayne J.